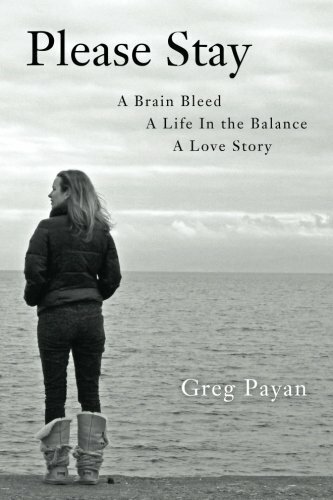 In “Please Stay: A Brain Bleed, A Life In the Balance, A Love Story,” Greg Payan describes the journey of enduring a traumatic event with the love of his life. The pages of this book are filled with both heartbreaking and heart lifting medical updates, joyous memories from friends and family, and one woman’s ICU experience from the perspective of her boyfriend. The reader learns the couple’s history of how they came to be, the struggles of both Holly and Greg throughout the ICU stay, recovery, and back to their life before the aneurysm took precedence. Throughout this telling, the reader also learns to love Holly through the many personal stories that Holly’s friends and family shared with Greg in response to his nightly updates about what happened that day with Holly, himself, or both of them. I loved the real time, day by day, account of what was happening with both Greg and his love, Holly. The only thing I didn’t like about this book was that it ended! I found myself looking forward to each nightly update, just as Holly’s loved ones expressed within this book’s pages. Greg also included medical statistics which prove how much Holly’s story was that of a miracle! I felt like I was witness to the bond that Greg built with Holly’s family and loved ones, bonds that would forever change his relationship with Holly in the future. Greg Payan creates an emotional attachment from reader to Holly and her progress. He created a page turner with his reality, both the good and the bad. Greg leaves no thought of his unwritten, doesn’t create superficial text, and only his heart is guiding his words throughout this book. “Please Stay: A Brain Bleed, A Life in the Balance, A Love Story” is a book you won’t want to put down, even after you discover Holly’s fate.